"Let me tell you what I think of bicycling. I think it has done more to emancipate women than anything else in the world. It gives women a feeling of freedom and self-reliance. I stand and rejoice every time I see a woman ride by on a wheel…the picture of free, untrammeled womanhood." Monday, December 12, 2011, the Washington Area Bicyclist Association will hold a forum that hopes to determine why over a hundred years after her statement, there are statistically fewer women bicycling when compared with men. The Women's Bike Forum (registration is required, space is limited) will begin at 6:00p until 8:00p at the in the small meeting room in the West End Neighborhood Public Library, 1101 24th Street NW. The roundtable discussion will include a panel of women who are active in the local bicycling community and will share their ideas regarding how to increase bicycling mode share by women. While the number of female bicyclists has seen an increase associated with the overall increase in people who ride bicycles in the District, according to a study, Bicycling renaissance in North America? Recent trends and alternative policies to promote bicycling, women represent about 27.7 percent of the approximately 2.0 percent of Americans who bicycle regularly. Linda Bake of Scientific American reports that not only is the total modal bike share percentage low in the United States but also the the number women who bike compared to other countries like the Netherlands, where 27 percent of all trips are made by bike, 55 percent of all riders are women. In Germany 12 percent of all trips are on bikes, 49 percent of which are made by women. The Scientific American article also states that one of the keys in increasing the number of bicyclists on the roads is to increase the number of women bicyclists. The report implies that as roads and bike infrastructure become safer, there is a likelihood that more women will bike. 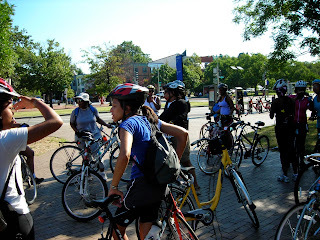 The number of women biking indicates just how safe it is to bike in a location. The following video seems to echo those assumptions. Women In Motion: New Lady Riders Reflect on NYC Cycling from Streetfilms on Vimeo. We'd like to hear your thoughts on women an bicycling. Is the key to bring more women to bicycling as simple as creating safer biking conditions for everyone or does it require additional outreach and woman-specific facilities? DC Bicycle Advisory Council. Theme images by Jason Morrow. Powered by Blogger.